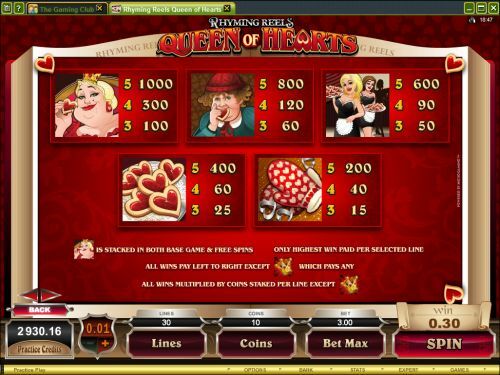 Rhyming Reels: Queen of Hearts Video Slot Review - Casino Answers! Rhyming Reels: Queen of Hearts is a 5-reel, 30-line video slot developed by Microgaming, featuring a wild multiplier symbol, stacked wilds, scatter wins, multipliers and a free spins feature. You can play the Rhyming Reels: Queen of Hearts video slot at Bovada. The Logo is the highest paying symbol on the Queen of Hearts casino game. If you land 5 Logo symbols on a selected payline, you will win the 4000 coin top payout. The Logo symbol is wild and will substitute for all other symbols except for the Scattered Crown symbol. The Logo is stacked during the free spins feature and will act as a 4X multiplier (during free spins only). The Queen of Hearts symbol is the second highest paying symbol at up to 1000 coins. The Queen of Hearts symbol is stacked at all times on the Queen of Hearts slot machine. The scatter symbol on Queen of Hearts is the Crown symbol. It will pay out if you land two scatter symbols or you can win up to 200X your total bet by hitting five scatter symbols anywhere on the reels. When three or more appear anywhere on the reels, you will win 10 free spins at a 2X multiplier. All free spins feature wins are doubled. the free spins feature can be re-triggered. You can win up to 2,400,000 coins during the Queen of Hearts free spins feature at Bovada! Queen of Hearts has an autoplay mode with advanced settings for customizable play. Hit the “Expert” button to gain access to the Queen of Hearts autoplay mode. You can play 5 or 10 quick autoplay spins or you can use the “Auto Play” button to expand to advanced settings. You can play 1, 5, 10, 15, 25, 100, 250 or 500 autoplay spins and you can set autoplay to stop if a win exceeds or equals $1, $100, $500, $1000, $5000 or $10,000. Autoplay will stop if you trigger any feature contained in the game. You can stop autoplay at any time. The brand new Queen of Hearts video slot has many different special features, a decent top payout and a well-done presentation on the part of Microgaming. You can play this new video slot when you sign up and make a deposit today at Bovada! Can American players play the Queen of Hearts slot game for real money? No, USA players cannot play this video slot at this time. However, you can play the many USA-friendly video slots over at Vegas Tech online casinos like Bovada. Can I play Queen of Hearts in my browser for free? 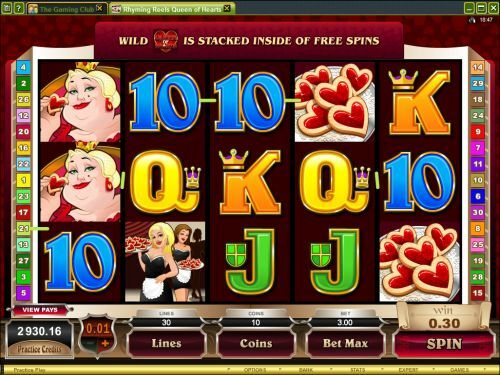 A flash game of the Queen of Hearts video slot is available to play for free or real money at Bovada. If you have issues with the flash video slot game, please download the latest edition of Adobe Flash Player.